Do Pocket Sprung mattresses get bigger ‘width ways’ after a period of time? Thank you for your question on our website. The dimensions of a well-made mattress will not alter over time. There is a natural settlement to all new mattresses and this can be alleviated with the proper care and maintenance of a new mattress. 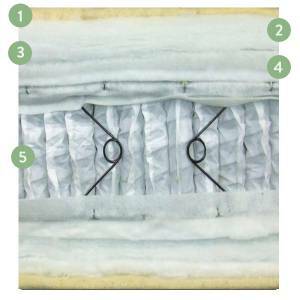 There are different types of springs in a mattress but the best by far is the pocket springs. Here at John Ryan by design we have two pocket sprung ranges and two different ways to support the edge of the mattress. In our Origins range, we use butterfly clips and in our Artisan range we put two rows of firmer springs around the edge of the mattress, this helps when you sit on the edge of the bed. The only reason I can think of that a mattress ‘gets wider. is if either the springs fail or come out of alignment. If this is the case with your mattress and you are still within your guarantee period, contact the retailer or manufacturer of your mattress. Hope this was helpful and if you require any further advice please do not hesitate to contact the office on 0161 437 4419. Our office hours are 8 am – 8 pm Monday to Friday and 10 am – 4 pm Saturday and Sunday.